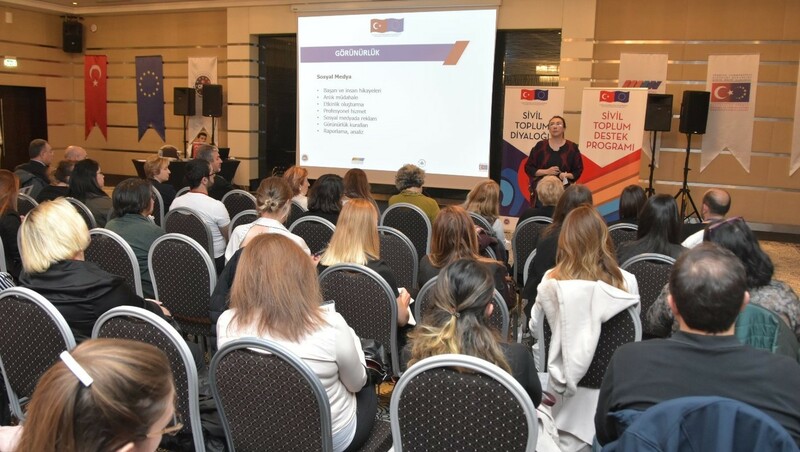 Project Implementation Training for grant beneficiaries of CSD V and CSSP II was completed and 150 representatives from various CSOs of Turkey and EU countries attended these trainings in Ankara on 10-11-12 April 2019. Grant beneficiaries were informed about procurement, implementation and visibility rules of the projects. Head of the Project Implementation Unit Ahmet Hakan Atik delivered the closing speech of the program. During the second phase of the IPA covering 2014-2020 period, under the Fifth Phase of Civil Society Dialogue between Turkey and EU V (CSD-V); a total of 7 million euros has been allocated to 40 dialogue projects that will be implemented by CSOs from the EU and Turkey. In addition to projects which directly target development of dialgoue and cooperation, there are also social projects for disadvantaged groups including people with disabilities, refugees and elderly persons. Furthermore, there are also sectoral projects that will be implemented in the fields of education, health, food, agriculture, environment and climate change and gender equality as a cross cutting theme. 32 projects are from Turkey while 7 are from EU countries and 1 from a candidate country Bosnia-Herzegovina. Second phase of the Civil Society Support Programme planned in 2015 sequential of the first phase aims at enhancing capacities of the CSOs for participation, reputation and stronger civil dialogue with a grant amount of 4 million euros. In the second phase, these priorities are supported: ensuring administrative and financial sustainability; enhancing communication and advocacy skills; development of participation in decision-making processes at local, national and international level; strengthening transparency and accountability; increasing the role of active citizenship. The program reaches out to a wide range of target groups such as women, children, youth and disadvantaged persons via CSOs working on fields such as health, agriculture, education, environment, food, and media. Within the scope of the second phase of the Civil Society Support Programme 31 projects were awarded from 12 provinces in Turkey.